Does the idea of an Internet-free evening, weekend, or vacation seem impossible to you? For most social media managers, the need to be constantly “on” is simply a part of the job description. Much of social media marketing requires timely responses and engagement tactics, and Instagram is definitely no exception. With its inherent “insta” nature, Instagram is a social network for which it seems especially impossible to imagine taking a break from. Whether you’re juggling multiple Instagram accounts or need a way to plan out weeks of Instagram content ahead of time, the ability to schedule your Instagram posts is something that was but once just a pipe dream. However, as many mountainous images with sans serif typefaces have told us, dreams do come true. To help you navigate these up until recently uncharted waters, we’ve outlined a step-by-step approach to scheduling Instagram posts. While Instagram purists may insist on staying true to the original instant purpose of Instagram, the platform has evolved so that most recognize that there is now a more thought out and curated approach taken by both brands and personal users today. It’s an understatement to say that Instagram is a huge marketing tool, so it makes sense that, just as with other channels, there is social strategy behind the content. While of course you still want to be sharing posts that are timely, engaging, and consistent, a large portion of your branded content can most likely be scheduled ahead of time. Thanks to evergreen content–”content that continues to be relevantlong past its publication”–the possibilities for this are limited only by your own creativity. In addition to allowing you to plan your Instagram content in advance of your upcoming vacation, the ability to schedule Instagram posts is especially helpful if you have multiple team members managing your company’s account. With this, you can easily collaborate on assignments and assign specific messages or content to specific users on your account. Different users can have different publishing permissions and capabilities, meaning that the whole process is more streamlined and under control. Furthermore, if using Hootsuite for scheduling your Instagram posts, you will also be able to see an overview of your scheduled content which helps with giving a bigger picture perspective of your social media strategy. You will be able to easily and quickly see if perhaps you’re posting too many images of your morning coffee, or if you could use some more photos of your actual product or service. This overview helps you get an overall feel for the brand voice and style you are projecting, which of course contributes to your general marketing strategy. One of the most-needed benefits of scheduling your Instagram is the time-saving aspect. If you are able to schedule a week’s worth of content ahead of time, you are able to spend the rest of your week concentrating on engagement and in-the-moment postings. It’s often more difficult and time-consuming to try and come up with new content ideas on the spot, edit the images, come up with captions, and think of appropriate hashtags, so in getting this done ahead of time you can more fully dedicate your time and energy to other tasks. If this all sounds great to you, it might be time to set-up your preferred social media management tool for Instagram scheduling. While the specific process may vary from tool to tool, the following guide (originally published here) provides step-by-step instructions for scheduling and publishing to Instagram from Hootsuite. Before actually creating a post, you will need to add the Instagram capabilities to your dashboard. Click on your Profile Icon in the launch menu and then Add a Social Network. In the pop-up window, select Instagram and press Connect with Instagram. 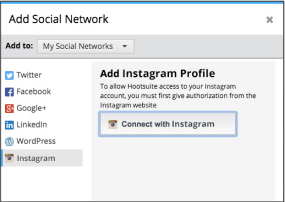 Enter your credentials and authorize Hootsuite to access your account. Pick the Tab you want to work with and select Add Stream. Choose Instagram from your list of connected social networks and select your Instagram profile. Create Instagram streams for your own posts, scheduled posts, hashtags, users, locations, and more. In the Compose box, add the text for your caption (hashtags and emojis are fully supported) and attach your photo. Then click Send Now, Schedule, or Autoschedule. At the time you chose to publish, you will receive a push notification from your Hootsuite mobile app. Note: Hootsuite push notifications must be turned on to publish to Instagram. Tap on the push notification on your phone to be directed into the Hootsuite mobile app. Review the post and when you are ready to publish, tap Open In Instagram. Note: Ensure you are logged into the Instagram account you wish to publish to. Once in the Instagram app, you can filter the image or tag users and a location. The caption you composed in Hootsuite for this image was copied to your device’s clipboard. Tap into the caption box, tap again, and select Paste to add the caption. Finally, tap Share to publish your image to Instagram. Now that you are able to schedule your Instagram posts, you can take more time and make that phone-free vacation dream a reality! 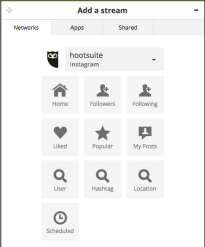 Start scheduling your Instagram posts with Hootsuite!